In 2008 BHW began a partnership with some people in Lahore who had a vision to equip young people in the Christian community to become self-sustaining. This involved starting a small computer training centre (PAK02) so they could be trained and go to the front of the line when it came to getting employment. Since that time more than 100 people per year have been trained at various levels and many of them have gained employment. In 2010 and in partnership with BHW, a clothing factory (PAK04) was opened employing many people in this community. The partners were also involved in building many houses for Pakistani flood victims. The next phase of development sees the establishment of a fund to assist high performing students get other forms of post-secondary school training. Many Christian young people finish school with good grades but because of poverty at home or not knowing the right people they struggle to get jobs. This programme is to bridge that gap, to get them into good learning institutions. Lahore is called a city of colleges and schools. Before the separation of India and Pakistan the British constructed many schools and colleges for Christians. The government of Pakistan then controlled all education and returned a few to Missions namely the United Presbyterian Church, the Church of Pakistan and the Roman Catholics. Now there are a few Mission schools and colleges but not for poor Christian students. Forman Christian College is a big hope for poor Christian students and many students want to get admission. Dur-ul Hikmat College is also a Christian Institute but they only teach arts and commerce subjects. Many Christian students want to get admission into nursing after completion of Matric (the final government examination at the end of secondary school). Previously students who passed Matric could go straight to nursing but recently the Pakistan Nursing Council made a rule that to get into nursing all students were required to obtain an F.Sc., a pre-medical qualification. This is a two year course and costs a lot of money. This has made it very difficult for poor Christian families to now get their children into nursing. In 2007 BHW was contacted by a group of people in Lahore. They had commenced a programme of church growth and development. EGM (Evangelistic Gospel Ministries) have a great understanding of holistic ministry and seek to tell people about the Christian message and at the same time to help the poor and vulnerable. In October 2008, the Bright Hope World Field Director visited Lahore and discovered that these people had a clear vision and a great plan for development. They had already commenced a number of sewing centres to assist women to train and to learn skills that would give them opportunities for employment. At that stage a decision was made to commence the computer centre as a first point of engagement for BHW. During a visit in early 2013 Edward Qasar presented the BHW Field Director with a proposal to set up a scholarship fund for exceptional students. Late in 2013 a decision was made to proceed with this partnership. The young people who cannot afford further education and training will be the direct beneficiaries in the short term but their families will also benefit in the long term as they will become income earners. Many of them would be forced into early marriage without education and employment. The community will also benefit by having these young people gaining employment and being able to contribute to their communities. They will escape the poverty trap and many of the evils associated with that. There is a clear commitment by the leaders to invest in the young people. They have developed a good strategy and have the people in place to lead this project. For a relatively small amount of money a young person can be given a real boost towards becoming a self-sustaining adult. For most of these young people, education is a dream, not a reality. The key person is Edward Qasar. 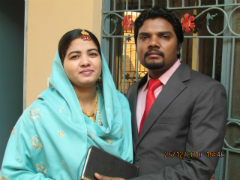 He was a school teacher before going into full time Christian ministry. He continues to see the need for young people to get good training. He understands that unless the Christians are better trained and equipped than other people it will be difficult for them to get a good job. Edward is married to Shakila and they have a small family. He spends a lot of time with young people, encouraging them, advocating for them and helping them reach their potential. Edward and Shakila live in the area of Yohannabad with their extended family, they lead a church there and he preaches around the country. The vision is to equip young people in the Christian community to become self-sustaining by funding high performing students into post-secondary school training. There are also five scholarships to five private colleges for women for similar courses. These scholarships are for student girls who cannot afford transportation to attend local colleges. All the Government colleges are far from Yohannabad where these people live. A few private colleges are available very near to Yohannabad. These scholarships are for Christian young people who have achieved merit marks in their studies. The opportunity will be announced in churches and schools. 15 scholarships will be for science students, five scholarships for art students, five scholarships for commerce students and five scholarships for computer students. The annual budget here is US$10,120. This will provide scholarships for 30 students. The initial committment is for two years after which time it will be reassessed. Arooj belongs to a Christian family and her father was paralyzed in 2007. Her mother works in various homes as a sweeper and struggles to earn enough for the four children and their studies. They are living in a rented house and many times they go without regular meals. The church is helping them with some funds for education. Arooj is very bright and gains the higest results in all her exams. She has easily passed Matric but she now requires finances for further study. Without this she will only ever get menial jobs and will be married to save the family money. She wants to become a nurse after obtaining F.Sc. “I want Arooj to study science subject and become a nurse and serve our nation” says her father, Asher John. Shahzad belongs to a very noble Christian family. He has completed Matric and is working in a factory. He wants to study commerce and become an accountant but lack of finances means his dream is unlikely to be realized. Sadaqat is in 10th class and the school management gave him notice that he would have to leave school unless his fees were paid, they were 5 months behind. His parents were not able to pay the fees so the church decided to pay for him. It is possible he will not be able to sit his examinations at year end and even less likely he will be able to go on to further training.